We are delighted that our business, Coffee Worx, has been shortlisted for the North Canterbury Awards on the 31stof August. The award that we are up for is, ‘The People’s Choice Award’. Here at Coffee Worx we are passionate about what we do, both at our café’s serving our fresh roasted coffee and as wholesale coffee roasters and distributors throughout the South Island. If you think we are doing a good job, whether you are a wholesale customer, one of our bagel fans, come in for good coffee, breakfast, brunch, order office catering or simply phone in your take away order on the way to work, we would very much appreciate your vote before the 19thof August. To vote simply follow this link or click on the image. 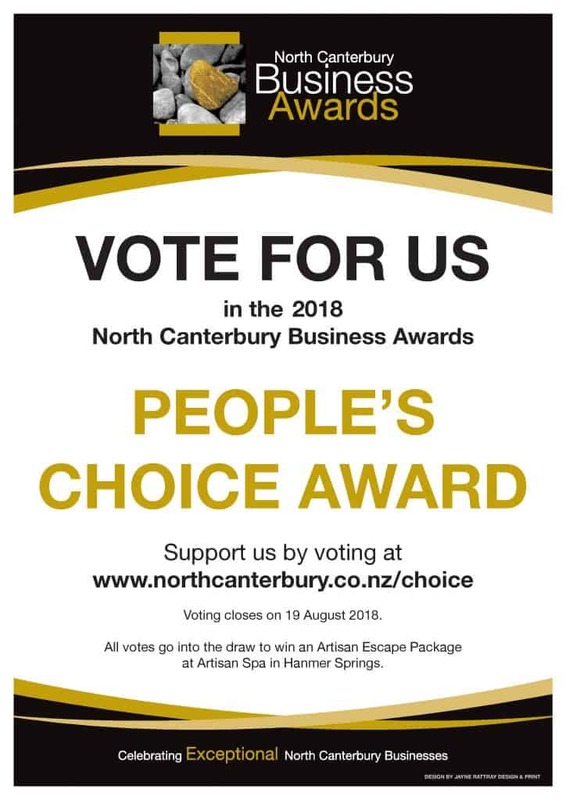 Please tell all of your fellow Coffee Worx supporters, family and friends as everyone who votes for us will go in the draw to win a sumptuous Artisan Escape Package at Artisan Spa in Hanmer Springs.